Adamson Falcons team manager Romeo “Don” Lerit Jr. demanded apology from University Athletic Association of the Philippines (UAAP) deputy commissioner Gregorio “Ogie” Narvasa III for unsportsmanlike conduct and “unbecoming of an official and a lawyer” that happened last August 31, right after the De La Salle Green Archers vs. Adamson Falcons game at PhilSports Arena, Pasig City. On a letter addressed to UAAP president Dr. Sergio S. Cao, Lerit formally filed a complaint before the UAAP board against Narvasa’s “display of arrogance and high-handed attitude towards a team official and a respected member of a UAAP family”. According to Lerit, Narvasa vehemently approached him after the game after seeing him clapping and saying, “Good job, ref!” to the referees. Deputy Commissioner Narvasa angrily shouted to Lerit, asking “Sino ka ba? Anong pangalan mo?”. Lerit replied with “I am Don Lerit, team manager of the Adamson Falcons”, which may have erupted Narvasa to grab and pull the ID around the complainant’s neck while screaming, “Loko-loko ka ha!”, then slamming it on his chest. Lerit stressed in his statement that Narvasa “started pointing finger in my face (dinuduro niya ako na halos masundot ang mukha ko)”. Upon seeing the commotion, Adamson University’s Discipline Section Head of Office of Student Affairs (OSA) Mr. Bernie Rances stepped in and said “Ano po ang ginawa ng manager namin?”. Narvasa violently unrestrained himself and asnwered back at the top of his voice, “Howag mo akong hawakan! Sino ka ba? Hindi mo ba ako kilala?”, diverting his anger while pointing his finger to Mr. Rances. “Nakita yun ng mga players, including yung mga nanonood dun sa venue. May mga kaibigan din tayo dun, my mga estudyante. Ano na lang sasabihin ng mga yun? Na yung school officials ginaganun sa harapan nila. It’s not right”, said Lerit. Lerit requested the UAAP board to order an investigation and perform necessary disciplinary actions to Narvasa, whose brother is the current UAAP commissioner Chito Narvasa. “Well, kung ganon hindi ko alam kung saan tayo aabot, whether I’ll be filing charges against him both civil and criminal. Tignan natin kung anong mangyayari. I have my lawyer with me and I’ve instructed several legal matters with him”, added Lerit upon knowing that Narvasa is insisting that he doesn’t need to apologize and just doing his job. A press conference was held last Pantalan Maynila Restaurant last September 3 to inform the media about what truly happened on the said incident. Lerit and Rances were joined by Adamson’s Vice President of Student Affairs Fr. Francisco “Kiko” Magnaye Jr., C.M., Adamson Falcons men’s basketball team led by head coach Leovino “Leo” Austria and Lerit’s lawyer Atty. Anselmo Adriano. “As far as I am concerned, they should be the one na magpapaganda ng liga. If there’s a commotion or untoward incident is happening on the game, they should be the one to pacify or intervene para ma-issue yung smoothness ng system dito sa liga”, said coach Austria who is present with all of the Adamson Falcons team members on the press conference. Adamson Falcons had a miserable UAAP season 71 and is currently suffering a nine game losing streak. The 6-6 record of UAAP season 69’s Adamson Final Four team which coach Austria handled was a far cry from the current 2-11 win-loss card. Officiating woes, player inconsistencies and internal problems plagued the San Marcelino- based squad, highlighting a record breaking loss with the biggest scoring margin in UAAP history with 31 points against last year’s lone winless team UP Maroons. “Well, I think very consistent sila, sa inconsistencies,” laughingly bared coach Austria with the media about the bad officiating by the referees which happened all season long including Adamson’s most recent setback against DLSU. “Hindi niyo naman na maririnig sa amin na nagccomplain kami regarding that dahil binibigyan naming sila ng benefit of the doubt. After all they are humans na nagkakamali, kaya lang kung piloto sila at human error lagi, it will cost their life. At gusto ko lang malaman bakit yung turnover ngayon tomorrow is not a turnover. Yung violation today, the next day is not. And they are very consistent with that inconsistencies”, added Austria. Lerit admittedly was “emotionally frustrated after the game for several non-calls that the referees did (or did not do) which could have changed the outcome of the game”. Last game, Adamson’s Marc Agustin was called for a traveling on a crucial scoring attempt, which was later reviewed and obviously should have been a non-call. Five seconds remaining on the overtime period with both teams tied, DLSU’s LA Revilla went inside the playing court without reporting to the table officials but got away without a technical foul, which could have wrapped up the game for the Falcons. “During 5.7 seconds, last possession ng La Salle pumasok si LA Revilla without informing the table officials. It took so long for them to inform the table officials and the referees are the one who is facilitating it. Nasa loob na sila. The play is about to start then when that particular player reported to the table officials. With 5.7 seconds and tied ang score, so it could change the outcome of the game. Pero wala kang maririnig sa amin because it’s the referees decision but before that play, I complained to the table officials. How come inano niyo ito without any technical (foul). But ignoring my appeal, the referees just continued the play. Hindi man lang ako binigyan ng chance na kausapin. I cannot stop the game because I’m just a coach so I will just follow on what they want to do. Kaya naging frustrated yung team namin, that’s why he was prompted na pumalakpak. It’s normal naman to any concerned parties na ipakita mo yung emotion mo sometimes. I don’t think na kung sarcastic man it depends on the manner, and there’s no abusive or profane language na ginawa yung manager namin,” explained Austria. “As long there’s no physical assault, I think, maganda yun para sa atin pero everybody has a passion for basketball. And everybody is trying to go at Araneta during La Salle-Ateneo games because basketball is passion of the Filipinos. Kaya dapat pagandahin natin ito”, added Austria. Lerit also claimed that this is Narvasa’s first time to display his violence on the playing court. “A couple of days back, as I was surfing on the internet, this is not something new na ginawa ni Mr. Narvasa. There is an incident before involving Mr. Narvasa sa NCAA (National Collegiate Athletic Association) naman.”, said Lerit. “Allegedly hinamon ni Narvasa ng suntukan ang isang matandang fan na nanonood during Letran vs. San Sebastian na nangangantyaw rin,” stressed Lerit exerting his claim on personal issues with Narvasa. ~ by Joshua Tadena on September 4, 2008. That’s not right talaga.. for me that was abusive, rude and to tapped it all, very conduct unbecoming ng isang Deputy Commisioner ang gumawa ng ganon sa isang Team Manager and School official infront of the entire basketball team and the viewing public.. Thing is, the entire Adamson and UAAP community ang binastos ni Mr. Narvasa.. I think the board must have a resolution regarding this incident..
what can i say? i watched the game on tv and it was very evident that the calls are always in favor of DLSU.. i can’t help but to feel pity. just another unruly n uncharacteristic of a sports official at that!!!! most likely ito ang isa sa pinakamatinding problems or shall i call it “disease” ng ating sports organizations kaya pati mga athletes natin e ala o kulang sa discpline. time and again, ito palagi ang sinasabi natin na leaders like the commisioners ang dapat mamuno sa pagpromote ng tamang sports attitude sa bansa to really come with world class athletes. Kaya nga marahil di tayo makagold man lang sa olympics is because most of the leaders of sports group in our country are headed by people like the deputy com of UAAP!!! Calling next year’s hosts FEU. dapat sa lazalle ay tangalin na ulit sa uaap sila ang sumisira ng reputation ng organization. sa dami na ng cases na ginawa ng mga members ng school nila kaya sila natapon dati sa ncaa. buti nga at pinayagan ulit silang makalaro sa uaap. 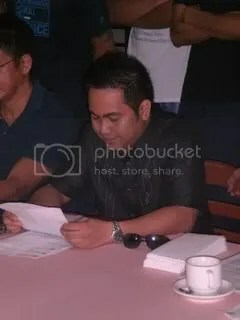 at kay mr narvasa ay dapat bigyan ng ultimatum ng president. not a good sample as a government official. fight for the name of our school ……. Wag naman anun, ferdie macanas. you guys are idiots. morons. you only heard one side of the story, and it came from an illiterate person. Adamson? You can BARELY call that a school. Mr. Tadena, please check your grammar. Thanks.